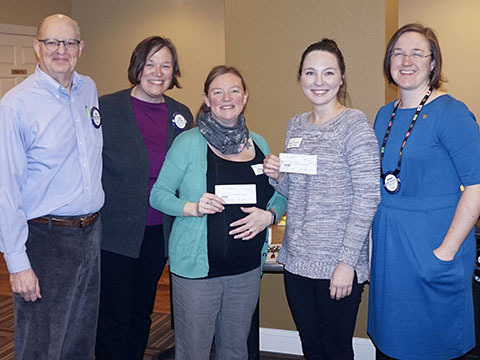 Rotary File for February 20, 2018 | Rotary Club of Iowa City A.M. 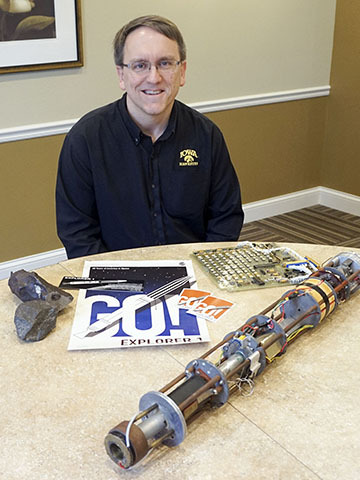 The speaker was George Hospodarsky, Associate Research Scientist, UI Dept. of Physics and Astronomy. His topic was Van Allen and Explorer I.
Phil Peterson used the theme of making a difference to introduce our community grant efforts and the successful results of the recent Trivia Night. He honored Amanda McFadden and Kate Soijka for their fortitude in planning and carrying out the event. Amanda and Kate announced the event partners from Table to Table and DVIP, who were presented with checks for $2186.62 each. It is possible to go to Big Brothers/Big Sisters of Johnson County site online and register to sponsor Mark Patton in the upcoming Bowl for Kids Sake. Can sorting was a success last Saturday. The Recycle Center was relieved of its mountain of recycle cans. Many Happy Buck moments were shared. George Hospodarsky, Associate Research Scientist in the Department of Physics and Astronomy at the University of Iowa talked about Van Allen and the Explorer I space project. Next to NASA and the space program in Russia the University of Iowa has built more space crafts and mission payloads than any other organization thanks to the ingenuity of James Van Allen and his students between the 1950's and Van Allen's retirement in the 1980's. Hospodarsky detailed the space-related projects that Van Allen instigated during each period of his career at the University of Iowa.